To quote a LOLcat somewhere - I has teh ill. I have been having stomach pains every few weeks since January. The GP sent me for a scan which revealed gallstones, but she said I wasn't ill enough to warrant an op. After several days of constant stomach ache, by Thursday I was unable to eat anything without being sick (witness: I had to pull over on my way home from work to vom up 2 segments of satsuma), and by Friday I had such blinding pain that the GP admitted me to hospital, where they have the morphine. Then it was a bit better. Then I ate some lunch on Saturday and it was worse, and they gave me more morphine. Today they have let me out for a couple of hours so I can do some work and tie up some loose ends for work - this is really bad timing, since that conference I have been organising for 14 schools starts tomorrow and I am smack bang in the middle of marking. But oh well. Better now than while I'm on holiday. Tomorrow, assuming hundreds of emergency appendectomies don't come in, I'll be parting company with my gall bladder and normal service will resume. But no OLS for the last week, because I basically haven't eaten anything, really. And no Fave Friday because I spent most of Friday crying and sketching out on painkillers. And no Tuesday ten next week either, because I'll be in until at least Wednesday, I think. I don't know for sure, though, because nobody has sat me down and talked me through what's happening. Luckily I had already done all the research online. Doctors love people like me, don't they? Yesterday was my tutor group's leaving day and ball, so I had a late one last night and not two minutes together for blogging all day. 1. On induction day, when they were still officially in year 6, C had a massive strop because B had spent the whole day hanging around K and C was jealous. C drew a disturbing picture on his whiteboard of K being shot in the head while he pointed and laughed. 2. C ate a lot of sweets in registration. One morning I confiscated them and replaced them in the bag with satsuma segments, and then hid in the cupboard until he came back. His reaction? "Apple would have been OK but she knows I don't like orange." 3. K sprayed aerosol over the bottom of a desk in textiles - LOTS of aerosol, ie so much it was dripping off - and then flicked a match at it and set fire to his own bag and singed his eyebrows. The class had to evacuate while Miss Hawker put it out with a fire extinguisher. 4. The boys came to afternoon registration every day for a week or so with a new toy and told me they were being sold in the canteen. I naively believed this until I was alerted to the fact that they'd been leaving school at lunchtime and buying these toys at the local pound shop. 5. Hat day, Christmas of year 11. When the girls suggested, as I sat knitting in my deckchair on sports day 6 months earlier, that I knit them all hats for Christmas, it seemed like a good idea. Then I actually had to knit them. But it was all worth it, they were so pleased with them. 6. When we changed classrooms at the end of their year 9, we all crawled into the bottom of the book cupboard (one at a time) and signed our names on the wall of the old room. They're still there. 7. In year 9, we did a tutor group assembly about the litter problem in school. Half the class dressed as rats while the other half went up on the gantry in the studio and threw scrap paper into the crowd. Then the "rats" ran around to the Benny Hill theme picking up the paper. The HoY's face was an absolute picture. 8. Tutor trips. I maintain we had more than any other tutor and they were all amazing, even the one where L had been ill all day but still really wanted to come and then vommed on the floor of the ice rink boot room. 9. The year I got married, Rihanna release Mr DJ and whenevr it was on the radio in the morning the boys would turn it up. M told me it was the official tutor group song. It still makes me think of them (and driving around running wedding errands). 10. The ball - has to be. They all looked so grown up and I realised how proud of them I was, even though this is a little weird because they're not my actual children. But it was amazing. S even managed to create drama one last time....she has been creating it for several years and was banned from the ball, but turned up fully dressed in her finery anyway and her parents had to be called to fetch her home. They were not happy. But, well...send your child to school on time, in correct uniform, and teach her not to scream obscenities at staff members and it all might have been avoided. (Same mum bought her 13 year old booze to drink at a morning school event earlier in the year - that made national news). Anyway. In a strange way I am impressed that S stayed true to form right to the end - she may have been vile to me but she has a lot of spirit and one day it might be useful. They're all good kids, really. Here they are - induction day, 2004, and last day, 2009. Next year, I'm taking on a tutor group going into year 11 who are losing their main tutor - which is just as well: I don't think I could cope with the emotional rollercoaster so quickly again! It should be the law that all yarn must be this beautiful. Pattern: Green Day - but I called it Santorini, because the blues remind me of pictures of the place. I knitted it in the round and carried the cable from the twisted rib up the front - it's not very noticable because it's not flanked by purl stitches but it adds a bit of interest. I added an extra repeat in the back and a few stitches at the front to size it up (although it's VERY stretchy and I'd probably have been alright without). I did my own thing with the armholes. I thought I was going to run out of yarn, so I knit myself two long straps first and then set out up the back, when it became evident that I WOULD have enough yarn to knit as per the pattern, but too late to match the decreases on front and back. It doesn't notice and I like how it turned out. 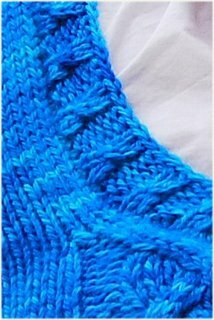 I knit the neckline ribbing with one twist to echo the waistband ribbing. A useful technique I used for this was spit splicing the yarn together at the end of a skein - really effective and has reduced the number of ends that need weaving in, as well as making the yarn go that little bit further. I really thought I was going to run out. My poor knitting group were forced to waste considerable amounts of their time helping me to pick out a complementary yarn to do the ribbing and agonising over how it could be changed, and in the end it was totally unecessary - though it was a close thing. 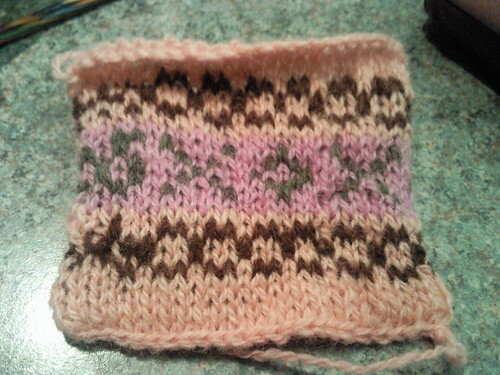 On this garment, I picked up stitches the way Liz Lovick taught us to at the Fairisle. You use a much smaller needle (I used a 3mm), pick up every stitch, then knit a round (don't knit the stithces as they're picked up), then switch to the recommended needle size and decrease across the picked up stitches until you get the right number. This worked like a dream. It came out superneat and actually made picking up the stitches a joy, whereas normally this would have languished in the UFO pile for a month or more while I put it off endlessly. Now, I just have to wait for the cold weather so I can wear it. ...I came across this blog, by a homeschooling mum called Kelli. She has all manner of little tricks up her sleeve for regular blogging, kind of like that knitting blog I mentioned a couple of months ago, including Work On it Wednesdays (WOW) where you did something you'd been putting off - that was a great idea but I sort of kept putting off setting myself a goal to complete something I'd been putting off. So (if you understood that) I never participated. Here's something easier though - Fave Friday. Five favourite things! Any things! How hard can it be? 1. Like Water For Chocolate, by Laura Esquivel. I wish I was fluent in Spanish and could read the original. Perhaps that would be a good challenge one summer. 2. Futuretrack 5, by Robert Westall. A teen fiction book I still pick up and read again every so often. I really like the story. 3. The Falls, by Ian Rankin. Anything by him, really, but that sticks out as a particular fave. Unfortunately, since most of his books are murder mysteries, they can only be read once. I love his writing, though - he's a real wordsmith. 4. Memnoch the Devil, by Anne Rice. I went through the Vampire Chronicles phase about a decade ago but this one has stayed with me because she has some really unique views on religion. I also really like Queen of the Damned but that's more of a ripping yarn than a thought-provoking treatise. Long weekend ahead. I never really realised, when I accepted my contract as team leader on my regular exam paper, that the fact it was PAID much better than bog-standard examiner is because it's more WORK. I haven't stopped this week and could only manage an hour at knitting group last night, even. Rachel didn't even have time to give me The Look. I've fallen back into the old routine of up at 6am, work for an hour, go to work, come home, eat, work until 10, Big Brother, bed, repeat. I love getting up at 6am, I get shedloads done and I feel much more with it during my commute and early morning school - it's a shame I can't force myself to stick to it unless my workload is double what it usually is. Luckily the team leading duties will tail off a little over the next week, once my examiners are well into their allocations and marking consistently. I'm sort of disillusioned with it, though. BUT I keep my eyes on the prize...3 nights in Sequoia, 4 nights in Yosemite, 3 nights in Tahoe and then 2 nights in a haunted B&B in Virginia City...oh yes, it will all be worth it in just 6 short weeks. I'm going to go bear spotting and rafting and swimming in lakes, and getting noshed on by big, Californian mosquitoes, and knit a lace shawl, and take 100s of photographs, and break in some new walking boots, and get an amazing pedicure at that salon near Father Hand's house, and buy Philosophy products, and visit Jimmy Beans in Reno and buy yarn....it's going to be awesome. I should mention the positive, actually - I taught a grand total of 4 lessons this week. FOUR. Out of 25. I have been hanging out all year for year 11 to finally pop off so I can get all of that time I spent slogging through their coursework and marking their mocks, and it's finally here! I can go to work for a rest, now. I can get eveyrthing done I don't have time for in the evenings. I have been so very productive this week. Go me. 1. A new phone. A Samsung Tocco, to be precise. 2. More of this nail varnish. I've had the red stuff on since Friday and there are no chips yet. 3. A gardener. It needs weeding. I can't be bothered. 4. One of those growing roof thingies for the garage, instead of the cracked, leaking asbestos we have at the moment. 5. A couple of pretty lever arch files and a clipboard - preferably something in a bright colour, with (guess what) polka dots. 6. A Nintendo DSi. Not a great deal of point in me owning one because I wouldn't use it ever so often - but I would use it on all my travels, which are extensive. 7. A pair of walking boots. This is more of a requirement, given that I'm planning Yosemite hikes. 8. 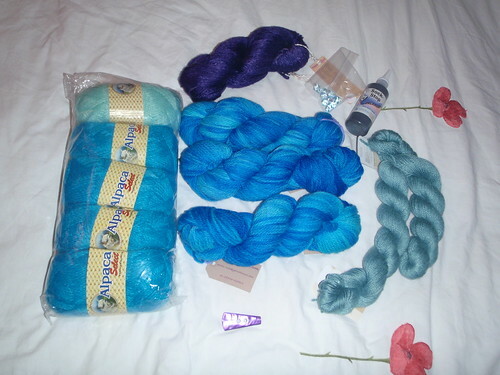 Some more Galatea yarn from Yarn d'Amour, in Skye Blue, so I can add sleeves and less of a daring neckline to the tank top I'm making and wear it as a sweater instead (yarn this soft should be next to the skin, imo). 9. A new easy chair for my classroom, to replace the one the caretaker made me bin after it was covered in smashed window glass last year. These days were made for sitting in the sun on my fire escape. 10. New shoes. Any new shoes will do, as long as they fit and are comfy and pretty. Shoes are always on the wishlist. One reason why I love participating in this challenge is that I get to read what other people eat and it gives me ideas. Most of my meals seem to revolve around eggs and potatoes with whatever seasonal veg I can find, so it's really interesting to see what other people come up with. Inspired, I decided I'd have some meat in this week's meal, and in fact we ate local two nights in a row, thanks to a stop at Springleaze farm shop on the way back from Brighton on Sunday. That night, we barbecued - burgers hand made on site from cows reared on their own farm, and locally produced sausages (I had Old Sarum, which were pork and redcurrant and possibly the nicest sausages I've ever had), and bread rolls. Last night we ate up what was left of the sausages with onion marmalade produced by these good folks, some mashed new potatoes and some yellow beans, and then I had some lemon meringue pie for dessert, since Springleaze sell their own homemade cakes. I also have some Marshfield Farm ice cream sitting in the freezer. I feel very lucky to live so close to Marshfield Farm because local ice cream might be difficult to find, otherwise. A scoop of ice cream may have made it onto the pie - I'm not going to lie to you. My tomato plants are getting quite big now, as is the basil plant I bought a couple of weeks back - but it's the courgette that's really making a success of itself. The plant has nearly covered up it's neighbouring tomato already. A salmon, to be more precise - a huge chunk of cooked salmon on top of the poor plant, and most of its skin, dangling over one side of the pot. Now, I know Bristol is technically coastal, but it's not really and in any case I live on the wrong side....I can only assume that (a) I pissed off the neighbours, (b) they had a big food fight or (c) (and most likely) a seagull fished (haha) it out of a bin and dropped it during one of the spectacular midair battles they have over the choicest bits of food. My lily was killed by a fish. How many people can claim the same? I was going to try and pass it off as a weekend FO but I actually finished it a couple of weeks ago and only just got round to writing about it. Yarn: Patons Smoothie DK in a gorgeous red shade - the colour is quite true in the picture even though my skin looks like I had a nasty accident with fake tan (which, incidentally, I don't use, because it makes me smell like feet). I bought 8 balls in an online sale and the stuff goes FAR - this only used a little over one ball. Mods: I did k2tbl instead of skpsso or whatever it is. I hate that decrease. k2tbl looks so much neater. I knitted this in a fit of pique, when I realised I had knitted the whole back of the cardigan I wanted to knit at the wrong gauge and probably wouldn't have time to rip it and knit it correctly. I decided I would knit this bolero in a day so that I had a back up - but I got bored with it after about 75% was completed so it actually took 5 days, and then it was Rav day and the new gorgeous blue yarn came into my life and the red cardigan has been temporarily forgotten about - though now I come to think of it, I would like it for my summer holidays. I wore it over a new stripey dress to my friend Beccy's wedding this weekend and thought I'd get a nicer picture out of it, but sadly Mr Z put his camera away before I put the bolero on, so you'll have to put up with the grainy camera shot for now. No picture this week, sadly - it was such a hurried end to the week and I'm still superbusy! I was lucky enough to be able to work from home on Friday, as I had exam board standradisation and this year it took place online. It all went very smoothly after a few technical issues - but I only had 25 minutes to cook myself some lunch. I boiled up some Maris Piper new potatoes with some fresh mint from the garden, roasted the last of the asparagus (local asparagus has now disappeared from the farm shops - BOO. It is such a short season!) and then poached some eggs in the potato water, so they came out quite minty too. I got all these things from Whiterow Farm Shop, and I also picked up some strawberries grown in Cheddar, some Somerset yogurt from a Guernsey herd, and some locally produced rhubarb and ginger jam, which, combined, made a very delicious and local dessert. I am getting the feeling that being a team leader for the exam board is going to mean less work later on, but far more work now. I got back from Beccy's wedding (more on that later) several hours ago and have been hard at it ever since. I need a nice picture of Tahoe or Yosemite taped to my computer monitor to remind me why I'm doing it. Oh well, at least real work got a whole lot easier from Friday. I've got so many spare hours this week I'm bound to find time to fill you in on the trip to London when London had no tubes, and the trip to Brighton with the dodgy hotel and the sunburn. Marking starts with pre-standardisation on Thursday - and the other team leader for my paper is about to jump ship which increases my workload by 50% (and my money....but still...) - so leisure time is going to be in short supply for the rest of the month, I fear. 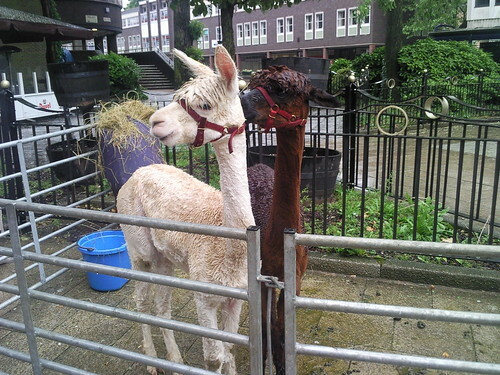 ...they are alpacas. Their owner said we shouldn't feel sorry for them, since they are from the Andes and cold, horrible weather is what they love. Some buttons - exactly the buttons I have been looking for for both the pretty lace cardigan I haven't touched for nearly a year, and the Central Park Hoody which is still awaiting its button band. I have literally been looking for buttons such as the ones I bought for years. ...and I got 2 skeins of Blue Sky Alpaca alpaca-silk blend as a thank you from my knitting group buddies who came along in my car. As if the £30 petrol money and cake weren't enough! I haven't been able to resist the aran merino (which does not look one tenth as amazing in this picture as it does in real life) and am about halfway through making it into a cabled tank top already. 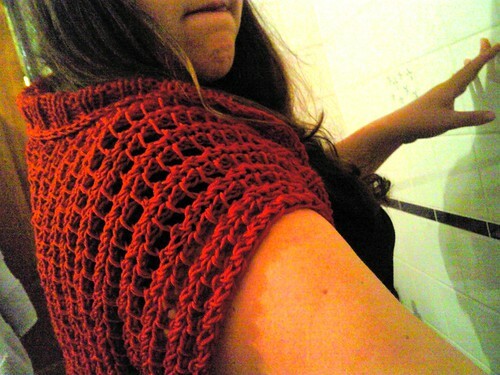 Because everyone needs and aran-weight wooly cabled tank top in June. 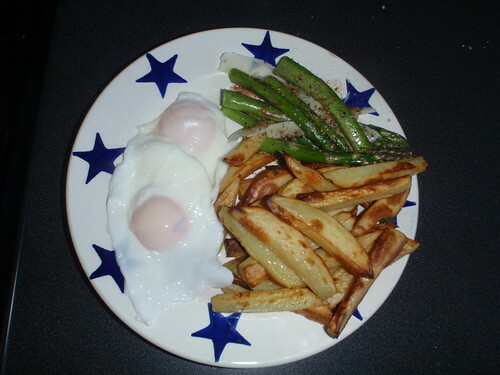 This week - eggs and potatoes from Whiterow Farm Shop nr Frome, and asparagus bought from the same shop and grown in South Petherton. That asparagus pops up all over the place - it's been in most of the farm shops I've been to recently (except Springleaze who, for one glorious week, were selling the stuff they'd grown on site, which was of unparallelled quality) AND my local green grocer up the 'wood. It was a good meal. The potatoes made particularly good chips and I dressed the asparagus with a little black pepper and Balsamic vinegar, and a sliver of Pecorino Romano produced by Jon Thorner's which is that SW company which produces a variety of local fare and distributes it to all the farm shops for selling. The Pecorino Romano is, unfortunately, of Italian origin, though - but asparagus season is so short and the combination of the two so spectacular that I decided being Jon Thorner's label was good enough for me. I went to Turner's farm shop this week too, for some Hobbs House bread and veggies, and picked up a white aubergine, which I've never had before. I also bought some courgettes there and have whipped up some ratatouille for lunches this week. I got chatting to the lady serving in Turner's about their production, since I was amazed at how big their veg patches have grown since my last visit. The veg I bought wasn't grown on site, but the lady said they are growing more and more all the time and it won't be long until they get chickens again. And since this article suggests that ethical and local producers are the only growth industry these days, hopefully they will go from strength to strength in the coming years. 1. Sunglasses. I have four pairs, currently, and am on the lookout for a nice pair of aviators - although since I do that irritating wear-the-on-the-head thing and aviators get caught in my hair, I might just go for another plastic framed pair instead. 2. Hammock. I have spoken of the wondrous hammock before. It is particularly lovely on nights just like this one, when indoors is far too stuffy and the grass is a little too twilight-damp for lying on. 3. Sun cream. I burn with alarming regularity. On the way to Mother Hand's last week I was forced to stop at every shop we passed until I found some for sale, just because the sun was beating down on my arm through the open car window and I could feel it getting ready for red. Also, sun cream is like a conductor for tanning - the higher the factor, the browner I go. Bizarre. I'm the only person I know who starts a holiday on factor 20 and goes UP to factor 30 when a base tan has been achieved. 4. Iced tea. A new one for me, this, but I have to say, those yankees know what they're on about. I've avoided it in the past since I don't like black tea, but then was struck with the idea to make fruit iced tea with the many varieties of fruit and herbal teas I have stockpiled over time. Totally refreshing - even more so now I've weaned myself off adding sweeteners. Not as sharp as diet coke and more interesting than water. 5. Hair clips. This time of year, I start to fantasise about getting my hair cut into a chiselled, cool little bob and feeling the wind on the back of my neck again. At this point, I go and fetch a big crocodile clip and whip the whole messy lot up into a makeshift French pleat, et voila....the long hair survives another year. Mr Z cheers, not remembering that when I have short hair, far less of it ends up in his food. 6. Cool showers with the window open. The window's behind the shower head, so this involves a little curtain-rearranging to protect my modesty, but there's nothing like a cool shower in a breeze. 7. Sun dresses. Like, a whole breed of dress, just for summer. Amazing. 9. Fans. This makes me think of an old 7-Up advert with the tagline, "I don't go anywhere without my fans..." and I know the feeling. I've got a desk fan which I try not to use since I'm quite certain it guzzles electricity like nobody's business, and a smaller, cuter, Bloomin' Breezy which is very handy for work and runs off the USB. This year I intend to get a handheld fan - not an electric one, just a flappy one - for my handbag. 10. Flip flops. I have just splashed out on a pair of Havainas, since my ski trip buddies were all sporting them and extolling their virtues. I had held out, since the not-very-comfy, turned-my-feet-black £2 Chavda pair were still going strong...but then, today, I was running to the exam hall with some glasses my tutee had left behind, when I tripped and fell, and snapped the toe post of said flip flops. So, yknow, I had to order another pair. I will have about 4 pairs now but they are the ultimate summer footwear, if only because they don't create gigantic white bits on tanned feet, like my Birkis do. I couldn't believe it when I tripped over. In front of three girls, too, who were sickeningly nice about it - to my face, anyway. I then had to walk into the exam hall, and right to the back, with one flip flop on, carrying the other. Luckily I was able to fix it up with a bit of hairy string I keep in my desk for doing floor graphs, so I didn't have to walk around barefoot all day.